Doha is a place with ambitious aspirations and opportunities that seem to multiply daily. Over the past 10 years, Doha has emerged as a center for business, culture, sport and education, as well as an emerging media capital. The city has drawn talented people from around the world, global citizens who have joined in the Qatari vision to grow and transform. The Qatari population has maintained a strong sense of tradition and culture amid this extraordinary change and massive influx of expats. 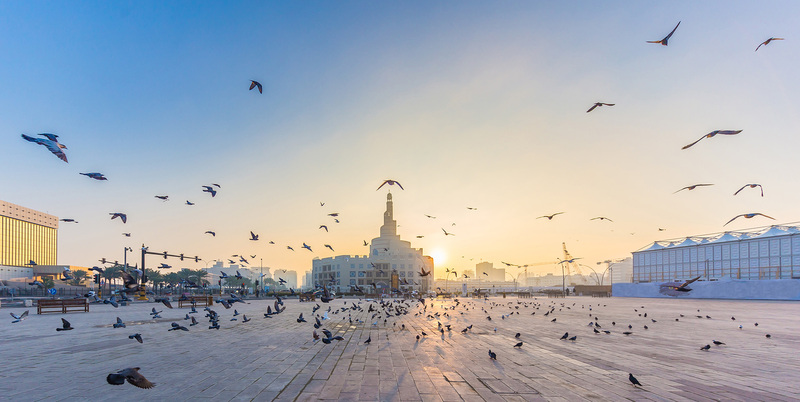 Qatari history and Islamic tradition are incorporated throughout Doha, from the architecture of the downtown core to cultural hot spots like Katara Village, Souq Waqif and the iconic Museum of Islamic Art. People come to live in Qatar from all over the world, which creates an exciting, diverse mixture of residents. Doha is an excellent place to meet people from different backgrounds, try new types of cuisine and enjoy fine arts from every part of the globe. Arabic is the official language but English is widely spoken. Doha comes alive when the sun goes down: crowds of people flock to the breezy Corniche, the labyrinthine streets of Souq Waqif or any of the hundreds of restaurants, shopping malls and cultural venues. Qatar is an Islamic country and visitors and expats are expected to be respectful of the traditions of the state. Qataris generally wear the national dress of abayas and thobes. Expats should dress modestly, covering their shoulders, knees and midriff and avoiding tight or revealing clothing. Al-Fanar Islamic Cultural Center is an iconic architectural landmark in the city of Doha. Islam is infused throughout Qatar daily life, with an abundance of mosques and prayer rooms. The entire city observes Ramadan: many establishments operate with reduced hours, restaurants and food outlets shut down during the day and non-Muslim residents are required to abstain from eating and drinking in public view. The holy days of Eid al-Fitr and Eid al-Adha are national holidays. All of the meat served or sold in Qatar is halal, and alcohol is available only in limited situations. For Christian expats, there are several churches on the outskirts of Doha where different denominations worship. Proselytizing about religions other than Islam is prohibited. Qatar is on a peninsula that juts into the sparkling blue Arabian Gulf. The coastline is generally sandy, although the northeastern coastline is home to mangrove forests and salt marshes. Inland, Qatar is almost entirely desert. To take a break from the city, Qataris and expats alike head to the beach for some time on the water, or to the desert for camping and dune-bashing. Qatar gets hot, with temperatures well above 40°C (105°F) during the period of May through September. Although it is considered a sub-tropical arid climate, humidity can be quite high in Doha during the hot summer months. For the rest of the year, Doha is much more temperate, with lovely sunny weather most of the time. There are sandstorms now and then, as well as occasional days of rain. A popular venue, the Museum of Islamic Art in Doha was designed by I.M. Pei. NU-Q hosts a busy slate of international speakers, academics, film screenings and community meetings to inform and inspire its students and faculty. As part of the Education City community, students can also take advantage of similar programming from other universities. View upcoming events at NU-Q. NU-Q and its neighbor universities have organized student activities covering a wide range of interests, including athletics, culture and student government. Qatar Foundation also organizes Education City-wide events that provide recreation, relaxation and a venue to bring the community together. The hub of Education City is the HBKU Student Center, with dining, cafés, shopping, a bowling alley, games room and fitness facilities like basketball and volleyball courts. The center is a great place to unwind with fellow EC students. 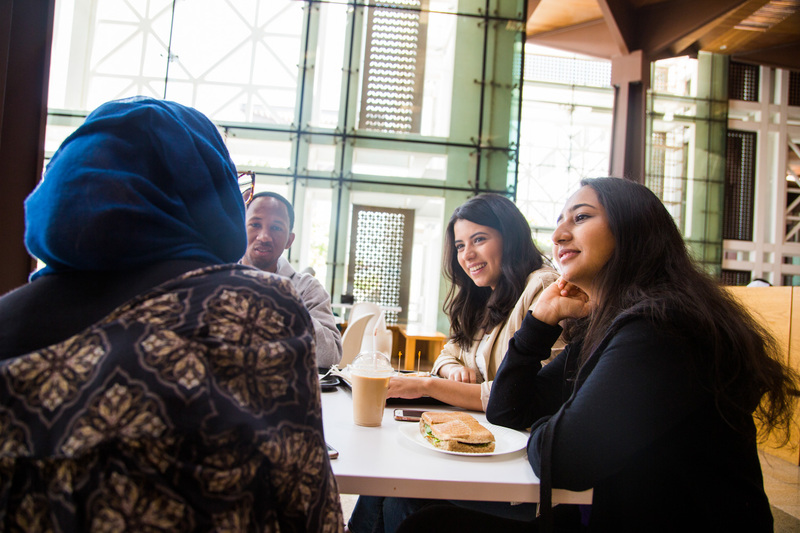 Students share a meal at HBKU Student Center on the Education City campus. The Doha landscape is changing all the time, with new shopping centers, restaurants, museums, sports arenas and the like going up at an extraordinarily fast pace. Among its many attractions are historic museums, exceptional international restaurants, modern shopping malls and traditional souqs, beaches, parks and an increasing variety of concerts, classical music performances, comedy, theater performances, sporting and cultural activities. Doha is also home to the Doha Film Institute, which hosts film screenings and events throughout the year. For the fitness-minded, Doha has several clubs, leagues, gyms and venues. The most well known is Aspire Zone, the former site of the 2006 Pan-Asian games; the facilities for the games have been converted into a busy indoor and outdoor hub of athletics for Doha residents. For sports enthusiasts, Doha is hosting more and more international tournaments in the lead-up to the 2022 FIFA World Cup. Some of the world’s finest athletes compete in sports like tennis, golf, handball and swimming, and these events will become more frequent as the World Cup approaches. For listings of the latest Doha events and activities, visit Time Out Doha, Qatar Happening, and I Love Qatar.